The menu always tops the list when it comes to the most important components of your wedding day. And remember, it’s your special day, so think about the type of catering theme that represents you and your partner best. To help get you inspired, here are a few of our favourite wedding catering themes for you to consider for the big day. Everyone loves classic, hearty comfort food. But, of course, the wedding day is all about the presentation as well as the taste. So start to think of your favourite comfort classics that you can ‘button up.’ You can dress up mini tacos, or serve up classic fish and chips in fancy rolled up newspaper cones, or even serve up mini shot glasses of beer alongside your favourite sliders and gourmet grilled cheese sandwiches. Whatever your comfort favourites are, go mini and get creative to incorporate them into your big day easily. Many couples are now opting for daytime weddings as oppose to evening times since it’s easier on the budget, which is why brunch style menus have become increasingly popular. And who doesn’t love a good breakfast and brunch spread? 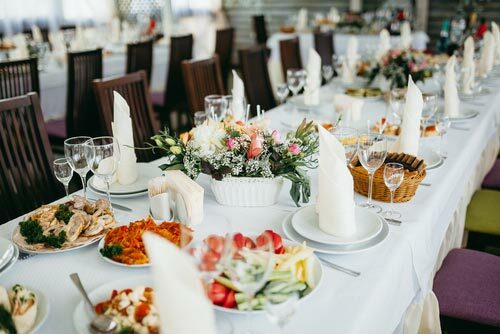 With this wedding catering theme, you can really get creative by serving mimosas, caesars, a pancake bar, an omelette station, pastries, and any of your classic breakfast favourites. Food trucks are popping up in cities all around the world, often serving up some of the best-tasting food you can get your hands on. So it’s no surprise to see more couples booking them for their wedding too. The variety, passion, and mouth-watering flavours that many food truck vendors serve up make this one of our favourite wedding catering themes that never disappoints. So don’t be afraid to chat with your favourite food truck vendor the next time you’re in line to see if they do weddings. Rustic wedding styles are more popular than ever. And alongside the rustic décor, you’ll find many buffet style catering themes that steer away from the traditional sit-down meals. This allows people to get up and interact more, and also choose the food and portions that they prefer and enjoy most. You can make your big day extra special with any of these unique wedding catering themes. At Centurion Conference & Event Center, we have everything you need to make your day just as you envisioned it. Contact us today to learn more about our facility and catering services.